Who doesn’t love a good karaoke? Only trouble is…most times, we can never remember the lyrics to songs we want to sing to. And of course some light background music to back up our vocals will definitely be an added advantage. 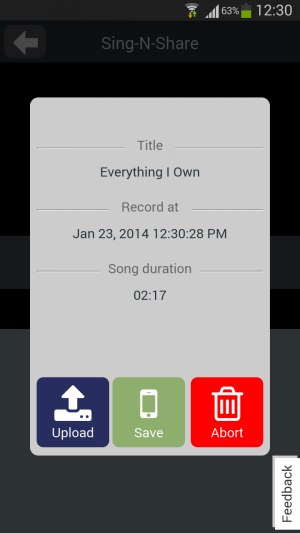 A karaoke app that is perfect for those times when we want all our favorite tunes and lyrics available in one location; one with all the right prompts to help us belt out those insane lyrics is Sing N Share. This one should give you plenty of good company when you want to karaoke alone or with your friends. Here’s my review of the Android app. Sing N Share works on the principle that you can login to Facebook or Twitter, access the 12000 odd fully licensed karaoke songs, record your tunes as you sing along, and upload it on the social platforms for the rest of the world to hear. Although the app also gives you the option to karaoke without signing in, the options are terribly limited . For instance you only have access to a small selection of songs and you cannot record the tunes or upload it/ save it either. The musical selection is categorized into popular genres such as Country, Pop, R&B, Rock including what’s new, and what’s hot. 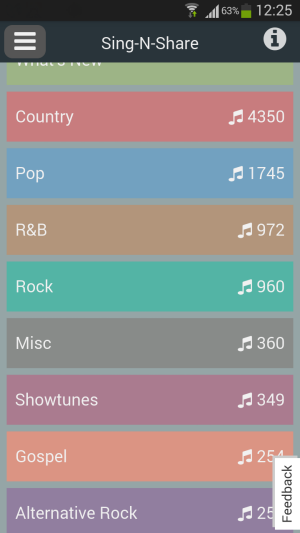 Selecting a particular category will display some of the smash hits in that category and you can tap on the song you want to sing along to. As soon as the lyrics start popping up and the music starts the song will automatically get recorded. You can tap on the screen to stop the recording at any time. When the recording is complete, you can save it on your mobile, upload it, or discard it if you think you did a laughable job. 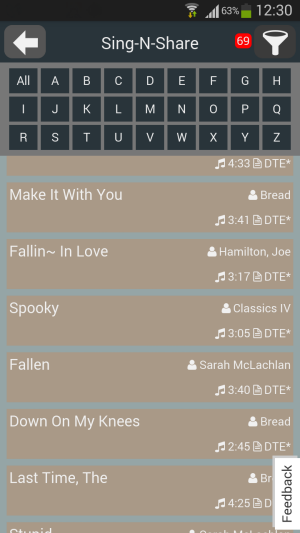 The app offers a simple menu option at the top that lets you search for songs and filter them according to the alphabets. The only downside that I discovered was that at times, the app was a little too slow to display the lyrics. 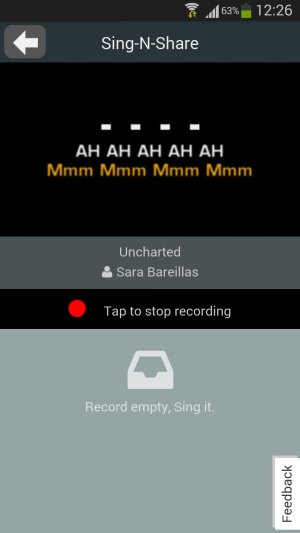 Nevertheless, Sing N Share is a fun karaoke app and if you love to sing, you’ve got to check out this free application. Some songs take a while to load up.